WTF Secretary General Jin Suk Yang (left) poses with Dr. Sinisa Jasnic, vice president of the Organizing Committee of the 2009 Belgrade Universiade, after signing a memorandum of agreement on taekwondo poomsae's inclusion in the official program of the 2009 Summer Universiade in a ceremony at a hotel in Belgrade, Serbia on May 13, 2008. The World Taekwondo Federation signed a memorandum of agreement with the Belgrade 2009 Universiade Organizing Committee to include taekwondo poomsae in the official program of the 2009 Summer Universiade in a ceremony in Belgrade, Serbia on May 13, 2008. 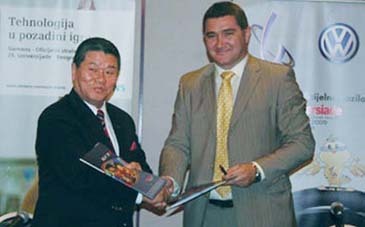 The MOA was inked between WTF Secretary General Jin Suk Yang and Dr. Sinisa Jasnic, vice president of the Organizing Committee of the 2009 Belgrade Universiade, in a ceremony at the Continental Hotel Beograd. With the signing, the taekwondo poomsae competition will be on the official program of the 2009 Belgrade Universiade, along with the taekwondo kyorugi competition. "The signing has further heightened taekwondo poomsae's international status at the Summer Universiade, and taekwondo has high chance of being adopted as a compulsory sport at the Summer Universiades," said WTF Secretary General Yang. Yang said, "I strongly believe that taekwondo poomsae, which is as important as taekwondo kyorugi, will be greatly promoted on the occasion of taekwondo poomsae's inclusion in the 2009 Universiade as an official program, together with taekwondo kyorugi." Since the 2003 Summer Universiade in Daegu, Korea, taekwondo (kyorugi) has been adopted as an optional sport at Summer Universiades, including the 2005 Izmir, Turkey Universiade, and the 2007 Bangkok Universiade. The 25th Summer Universiade is scheduled for July 1-12, 2009, in Belgrade, and the taekwondo kyorugi competition is set for July 1-5. WTF Secretary General Yang and Dr. Jasnic met at the headquarters of the WTF in Seoul, Korea on February 24, 2008, in which they agreed to sign an official contract on taekwondo poomsae's inclusion in a ceremony in May in Belgrade. "Given taekwondo's high popularity," Dr. Jasnic, who also serves as general director of the Universiade Belgrade 2009, said, "taekwondo will be a compulsory sport of the Universiade in the near future." Dr. Jasnic said, "Compared with the taekwondo competition at the 2003 Daegu Universiade, taekwondo has greatly developed, and in the near future taekwondo will be the leading sport to the student population." "Taekwondo is one of the most successful sports at the Universiades and we have seen a continued increase in taekwondo activities, especially at the 2007 Bankok Universiade, he said, "It is a fact that taekwondo is becoming a very, very popular among student population." Besides the 2009 Universiade, Belgrade is to host the 10th World University Taekwondo Championships on July 16-20 this year.